"When you're a detective and a man visits you, it's usually about his wife." 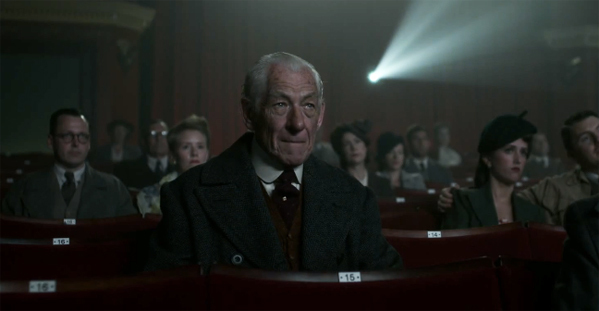 So far we've only seen a couple brief teaser trailers for Mr. Holmes, the British drama that sees Lord of the Rings and X-Men franchise star Ian McKellen played an aged, retired Sherlock Holmes. Now a full trailer from across the pond has surfaced showing off more of the story. It looks like Holmes is out to clear up some details that his partner Watson exaggerated in some stories he wrote after their partnership ended, particularly in his final case. In addition, he seems to be mentoring a little boy, one who could go on to become a future detective. Watch! You can still watch the first teaser trailer for Mr. Holmes right here. Mr. Holmes, or A Slight Trick of the Mind which is the title of Mitch Cullin's novel this story is based on, is directed by Oscar winner Bill Condon (of Gods and Monsters, Kinsey, Dreamgirls, The Twilight Saga: Breaking Dawn, The Fifth Estate previously) from a script he co-wrote with Jeffrey Hatcher. An aged, retired Sherlock Holmes (Ian McKellen) looks back on his life, and grapples with an unsolved case involving a beautiful woman.The film premiered at the Berlin Film Festival earlier this year (read Alex's glowing review). Roadside Attractions releases the film July 17th this summer. Follow @IanMcKellen for more. Noticed they included a blurb from you guys. Cool. McKellen (or whomever posts to his Facebook for him) also noted your quote when he posted the trailer video on his account. This trailer is way better than the first one we got. But I have to admit, I've come to expect a bit more from a Sherlock Holmes story than what's being presented here. I trust there is mystery, I hope there is some suspense, and I doubt there is any real danger. There's no murder here. Ok, I can go with that. But no decadence...? Come on ..!? !